The Turfgrass Group requires Crop Improvement Association Certification on each of our proprietary varieties. Our objective is twofold. First is to maintain the genetic integrity and uniformity of our varieties. Secondly is the fact that Crop Improvement Association Certification is the only third-party quality assurance program designed to protect the consumer, which requires that each of its producers adhere to a rigorous set of guidelines, inspections and oversight protocols. 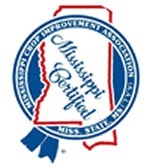 Each state has a crop improvement association or division of state government which establishes standards, procedures, and labels for certified turfgrass. These standards and procedures require regular field inspections, typically three times each growing season, to identify the stated variety, undesirable plants and whether there are other turfgrass varieties, referred to as off-types or contaminants in the field. 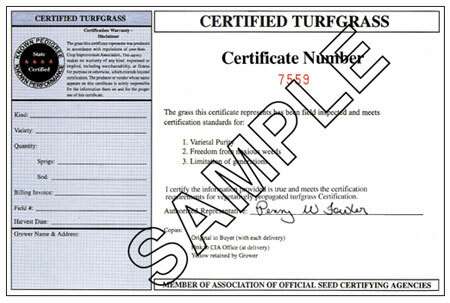 Only sod and sprigs harvested from these fields which meet these strict inspection standards can be officially identified and sold as certified and must be shipped accompanied by a blue certified turfgrass label. With the objective of maintaining genetic purity and freedom from contaminants, the certified turfgrass producers in our program adhere to rigid rules and procedures enforced by each states crop improvement association and by The Turfgrass Group. 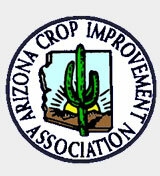 Crop improvement association inspectors inspect all certified production fields before planting is permitted to make sure that no contaminating weeds or other turfgrass varieties are present. Once a prospective production field has passed inspection, certified turfgrass production fields are then planted with material from a known source. All planting material can then be traced and documented to foundation production plots established by the private breeder and/or University of the specified variety. The certification label is usually a certificate attached to the shippers (turf producer) bill of lading or invoice. It will be blue or have a blue portion listing the producer’s name, variety name, quantity shipped, harvest date, field location, etc. The blue certification label is produced in triplicate with one copy going to the state certifying agency, one copy going into the files of the producer, with the final copy being supplied to the purchaser, which completes the certification process.